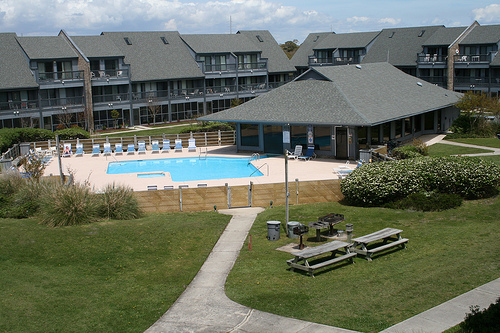 Located in Emerald Isle off Coast Guard Road, this is a quiet condo development. 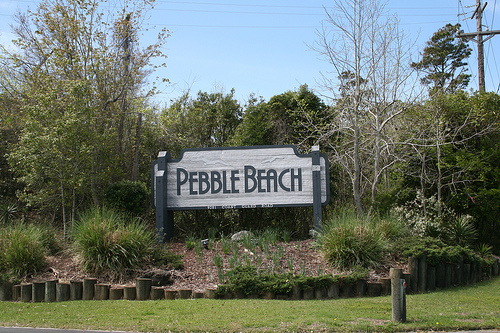 For those seeking a vacation rental, Pebble Beach Condos is a good fit for a family vacation rental. It’s even a good fit for retired couples who want to reside permanently on Emerald Isle. Many of the buildings offer beautiful oceanfront views. With manicured landscaping, the access to the oceanfront meanders by a clubhouse, outdoor pool, kiddie pool, and outdoor showers. Each three-story condo building offers a variety of condo sizes with studio units, one-bedroom, two-bedroom and three-bedroom condos available. We have rented numerous condos at the Pebble Beach condo complex over the years and of the units we have rented, the 3rd floor studio unit in Building F (unit 306) was the most recent unit we rented. While this particular unit slept two in a pull-down bed, and two more on a pullout sofa, the unit was very ordinary and the overall condition was below average. Ironically, at the time we rented this particular unit (first of April 2008), the unit was for sale for $147K. We have since been advised (6/4/08) this unit has been purchased and is due to be updated with new flooring, paint, bathroom upgrades as well as new furniture, art work and much more. We can’t wait to revisit this unit to give you a first-hand report of the wonderful improvements the new owners are making. If you’re seeking the perfect couple’s retreat or maybe a reasonably priced small family vacation condo on the Crystal Coast, our recommendation is consider unit #306 in building F of Pebble Beach condos for your next vacation. While you might read on many real estate rental websites that the Pebble Beach condos are “centrally located in the heart of the Emerald Isle“, that’s not necessarily the case. 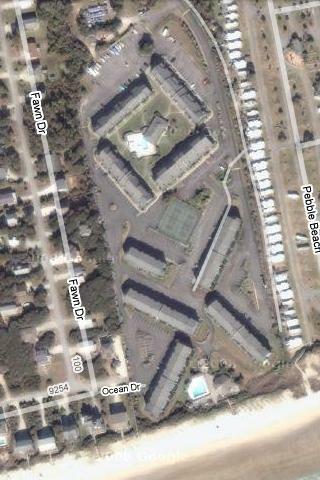 Of course, it depends on one’s interpretation of the “heart” of Emerald Isle. If the Bogue Inlet Pier is the central location of Emerald Isle, I tend to think the Pebble Beach condo development is located toward the “eastern” end of the island. Yes- you can walk to several businesses including a few restaurants and shops (ice cream/coffee/wine). The community is also located near (long walk or bike ride) many family-focused attractions such as a waterslide, batting cages, arcades, quarter-mile go-kart tracks, kiddie rides, bicycle rentals and a putt-putt golf course. You must secure a parking pass and gate card from your Crystal Coast real estate rental agency (normally in your rental packet) as there is a 24-hour security gate at the entrance. High-Speed Wireless Internet Now Available at Pebble Beach!